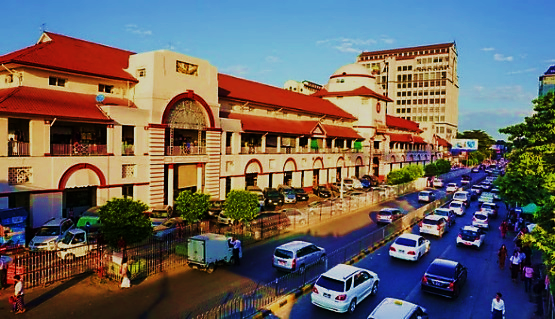 Arrive in Yangon, where you are met and transferred to your hotel. Today, enjoy your first taste of Myanmar, a profoundly Buddhist country, where many ancient traditions still flourish. Visit the Reclining Buddha at Chauk Htat Gyi Pagoda, a 213-foot-long statue with an expressive enamel face. This evening, transfer to Shwedagon Pagoda, the most sacred Buddhist site in Myanmar, for a sunset oil lamp lighting ceremony. Standing nearly 330 feet tall, the venerated stupa is covered in gold leaf and topped by a finial encrusted with thousands of diamonds, rubies, sapphires and other precious gems. View this mesmerizing wonder firsthand, as your local guide explains the history behind the holy relics it enshrines, which include strands of hair from the head of Siddhārtha Gautama, the Buddha. Tonight, gather for a special welcome dinner. Fly to Bagan, a city with more than 2,000 Buddhist pagodas and temples, the first of which was built by King Anawrahta in 1044. 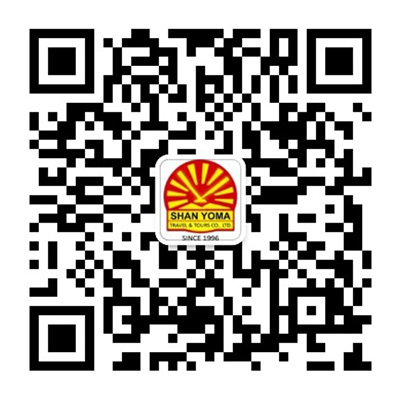 Upon arrival, you are taken to a local restaurant for lunch before continuing to your hotel. 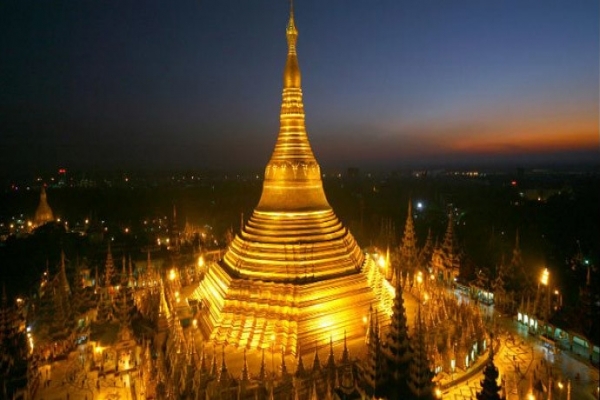 After a short rest, continue your journey to see the Shwezigon Pagoda, Bagan’s greatest reliquary, built to house the Buddha’s collarbone, frontal bone and tooth. At sunset, Ride Like a Local as you weave your way through the temple ruins on the back of a horse cart. 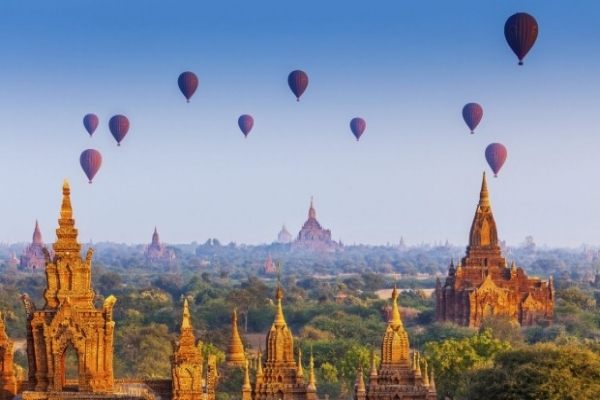 Rise early for an exhilarating hot air balloon ride (weather permitting) over Bagan, as dawn illuminates the gold- and sand-colored stupas. After breakfast, visit the well-preserved Ananda Temple, built in 1090. Next, travel to the village of Wetkyi-In to see the wonderful Kubyaukgyi Temple, renowned for its ancient murals. 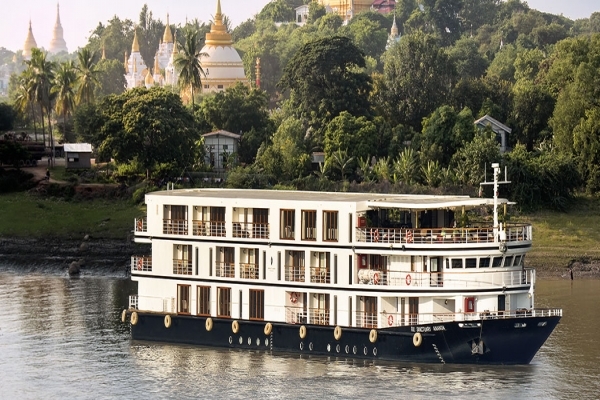 Board luxurious all-balcony ‘Sanctuary Ananda,’ your home for a three-night cruise on the timeless Irrawaddy River. After lunch on board, visit a local lacquerware workshop before proceeding to a temple to enjoy the sunset. Return to the ship for dinner. After breakfast on board ‘Sanctuary Ananda,’ explore Nyaung Oo Market and observe the locals selling and bartering for goods. Return to the ship for lunch and begin your cruise along the Irrawaddy River. Listen to a special onboard talk about Myanmar’s history and vision for the future, followed by demonstrations of the longyi (traditional Burmese cloth worn by men and women) and thanakha (a white cosmetic paste made from ground bark). Today, learn the secrets of Burmese cuisine during a cooking demonstration at a delightful Chef’s Table experience. After lunch, disembark to visit Sagaing, a former royal city renowned for its monasteries, pagodas and stupas. 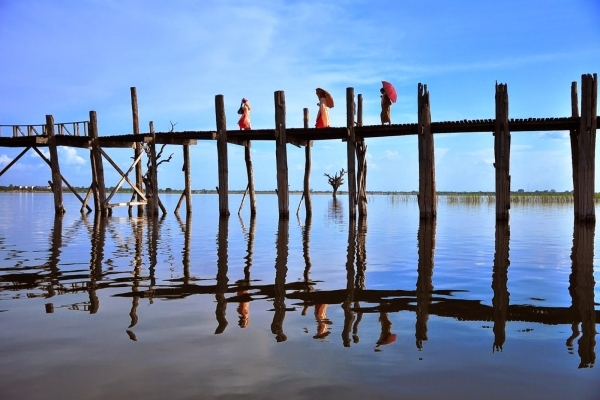 Proceed to Amarapura, where you embark by boat to view the picturesque U Bein Bridge — the oldest and longest teakwood bridge in the world. Watch locals riding bikes, carrying crops and commuting from work cross this tall, iconic landmark for an insight into everyday life here as well as an ideal sunset photo opportunity. 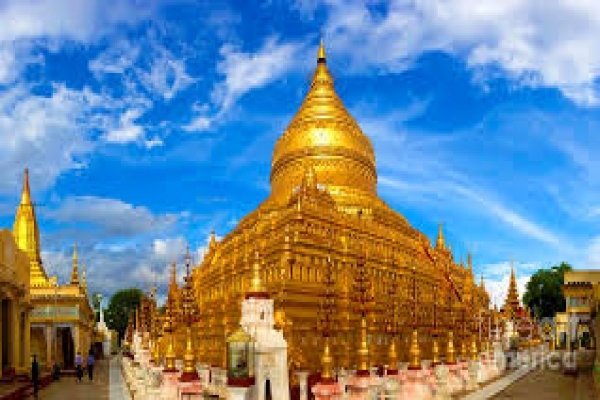 After breakfast on board, explore a gold-leaf workshop, where the metal is hammered paper-thin and prepared for use in some of Myanmar’s holiest sites. 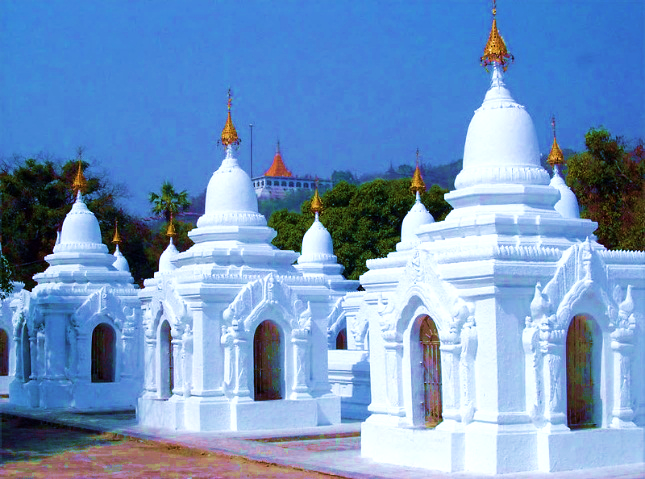 This afternoon, visit the Shwenandaw Monastery and view the more than 700 marble slabs inscribed with Buddhist religious texts at Kuthodaw Pagoda, referred to as the biggest book in the world. Later, witness evening prayers at Shwe Kyin Monastery. Fly to Heho and drive to Nyaung Shwe to visit a Shan paper workshop. Enjoy a firsthand look at the artisans who produce this distinctive paper, using fibers from the mulberry bush, and craft a wide range of items from it, most notably Burmese parasols. 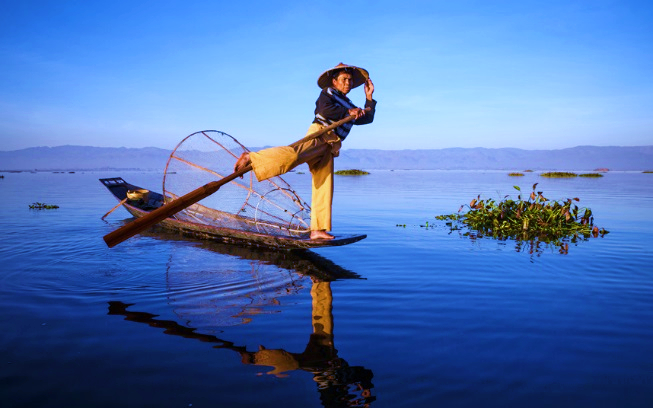 After lunch, board a boat and explore the ingenious floating gardens of Inle Lake. 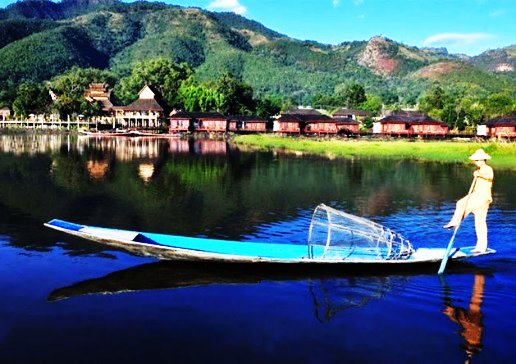 To create these gardens, used for growing fruit and vegetables, fishermen gather together lake plants such as water hyacinths and seagrass and anchor them with bamboo poles embedded in the lake bottom. Layers of mud, ash and more vegetation are then applied to form a farmable surface strong enough to stand upon. Also, visit Nga Phe Kyaung Monastery to view the Buddha statues on display in intricately decorated shrines. 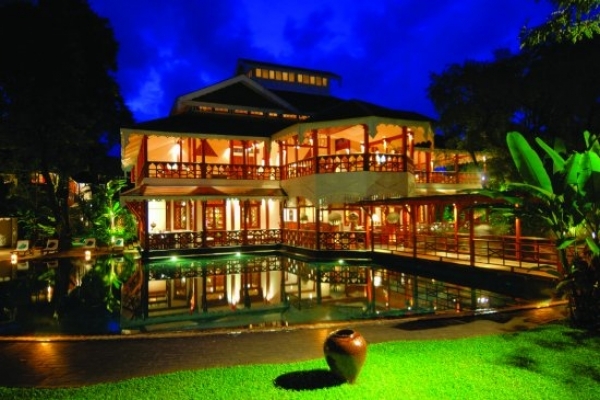 Transfer to your lakeside boutique hotel for the evening. Visit the Fifth-Day Market, where hill tribe people in traditional dress barter for goods and produce. Stop for lunch at the Intha Heritage House, savoring dishes made from recipes handed down for generations. Then, privately witness an Intha boat race with afternoon tea. Marvel at the coordinated effort required by the 20 participants per boat, each using the traditional single-leg rowing technique that local fishermen still employ. 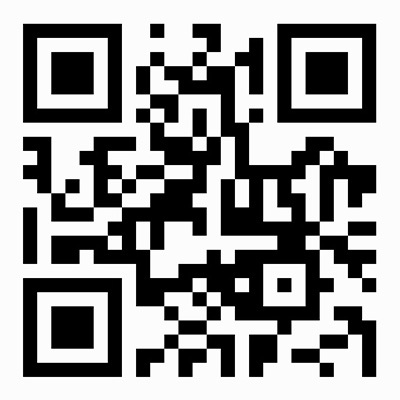 Fly to Yangon and transfer to your hotel. After time at leisure, visit Bogyoke Aung San Market (Scott Market) to see where locals gather, socialize and shop. Later, savor afternoon tea with a local writer, artist and intellectual who shares her insight into contemporary Burmese culture and politics. Tonight, toast your time in Myanmar at a special farewell dinner.